He said “sibseba,” which in Amharic means meetings. This was because every time he asked me where I was going, I used to tell him, “sibeseba.” Back then I was coordinating the Ethiopian civil society preparation for the Rio+10 Summit held in South Africa. I laughed at it then, but now 15 years later, I still globe trot from one meeting to another. This year so far, I have participated in nine international meetings. I was active in all of them either as part of the organizing group or as a presenter. I am seeing and feeling that there is at last a realization that change – fundamental change in the way we are living – is at last being recognized by almost every one, except the few who are either stuck by their free will or through the system, or those who benefit from maintaining the status quo. The majority of us are caught up in this paradox of deeply understanding in the kind of transformation that is needed, but still being part of perpetuating the same system that we rile against. These nine international meetings I have attended this year all had transformation to sustainability at their core, albeit from various angles. Many came to it through agriculture and food systems. Others talked about the role of learning for transformation. Some others looked at it from the angle of soil carbon sequestration for reducing the impact of climate change. There was a meeting in Kigali on Sustainable Development Goals (SDGs) and the World in 2050 where discussion was held on pathways to transformation beyond the SDGs. There was even a conference in Scotland with an explicit agenda, ‘Transformations in 2017’. A meeting among learning and education professionals in Sweden went even beyond the word transformation and discussed about transformative and transgressive learning for sustainability. We cannot talk of transformation without participation. 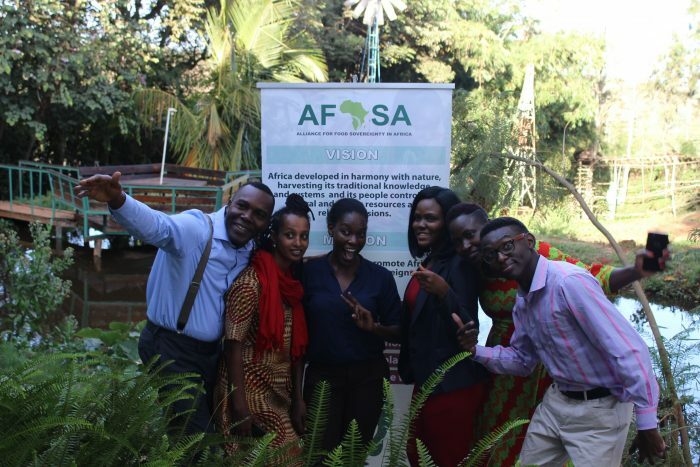 We know in Africa the space for civil society and civic engagement is narrowing by the day. And yet, the continent is going from crisis to crisis. The doors of our government offices are wider open to rich corporations, philanthro-capitalists, and development agents from the Global North than its citizens. How can we get a space in the political arena to help shape our transformation? There is a growing recognition for the need to manage the transformation of urban areas. It is not only that more and more people are living in urban areas, but that they determine both the politics and the production of food in rural areas. Urban areas themselves need transformation in how they are governed if there is going to be a better future for their inhabitants. Anyone who has seen the astronomical growth of urban areas in Africa and the impact that this is having on the urban social and environmental ecosystems can attest that things are not going very well. This is much more apparent in Africa where urban planning is at its lowest. Even if the plan exists, it usually fails due to lack of capacity in implementation and most due to shoddy business and political interests. There is a growing collaboration between social and natural scientists. I think natural scientists are at last respecting the knowledge and perspective that social scientists bring to the discussion on transformation and this is quite evident in all of the meetings. It is pleasing to the soul to see how in almost all of the meetings, art was given a space to enthuse and visualize the transformation. Various types of artists were invited to open people’s hearts and minds to show them the possibility of transformation to sustainability. In one of the shows, I saw a young woman come on stage wearing a white shirt and sat in front of us with a lot of fruits and wine. Without talking she drank the wine and ate the fruit while at the same time staining her white shirt with food and drink. You felt sorry to see the beautiful, white shirt spoilt like that, but her message was that the shirt represents the earth and the act of soiling the shirt represents the behavior of human beings on earth. Almost everyone was saying that ‘how can we talk about transforming the world while we are deeply entrenched in our own values and beliefs that seek our temporary comfort?’ There were a lot of suggestions on how to do that. One of the presenters in Dundee, Scotland, for example, said we can do mindfulness meditation every morning to help us be conscious of what we are choosing to do in every hour of the day. That will help us be conscious of what we are buying and how we are behaving. The importance of learning for transforming was emphasised time and again. I think this is where theories and practices in education have been really making an impact. Almost every meeting was repeating the famous statement most often attributed to Einstein, the definition of insanity is doing the same thing over and over again and expecting a different result. The implication is that you need to stop and think about what you are doing and change course for a deeper level of transformation both at the personal level and at the bigger systems level. At the AFSA Strategy & Capacity Building Workshop in October 2017. Transformation cannot happen with knowledge that comes from one source. Better understanding comes from a confluence of multiple perspectives, was the mantra in most of the meetings. As such, there was a wider level recognition that we need to incorporate knowledge of Indigenous and local communities in our planning for transformation to sustainability as they have a historical, temporal, and spatial understanding of their landscape. There was a wide understanding that there has to be a mind shift at a higher scale and at a higher level for transformation to happen. There has to be a massive level of ‘NO!’ to what we are doing and a collective voice of ‘YES!’ to sustainability. There was an example of how smoking was almost normal or mainstream, but how science and political decisions has changed that course in many places, even though industry fought hard to retain the status quo. Planetary boundaries are becoming a huge force in bringing consensus towards having economic and social development in the context of the Biosphere. These nine boundaries will put us in a huge problem if they are crossed. Mind you we have already crossed the climate, biodiversity, and phosphorous and nitrogen boundaries. There seems to be a growing consensus of going beyond sustainable development (with equal emphasis to economic, social, and environmental goals) to where economy should be managed to serve the society and both the economy and society should flourish only within the limits of the Biosphere. This is quite radical in a world where economic development is the only driving force and a cause of much social destruction. I read a growing realisation in all of the meetings that we live in a complex world where it is difficult to isolate and point to a single cause and effect to an experience. What we need is to understand that there are multiple causes and effects and we need to take interdisciplinary studies and multiple approaches to bring about a solution. Although reductionism, an attempt to explain complex processes through physical and chemical processes, can be good in creating machines, it has so many limitations in explaining complex social and natural phenomena. We need complexity thinking to help us navigate through this unpredictable world that we live in. This is also at the heart of the resilience thinking. Someone even said that a traditional evaluation framework forgets this fact and tries to measure progress through numbers. This is much bigger than you think my friends. Does Log Frame Analysis work for example? Can you actually measure the success of your project by the amount of money that somebody gets, or by the number of seedlings planted, or is there another way of looking at it? Complexity assumes that we need to use all available information from as many sources as possible to reach a conclusion if our purpose is to foster resilience. I think one of the most exciting angles that resilience thinking is taking is stewardship. The basic premises are that people have other relationships with their environment than economic benefits. They have cultural and spiritual relationships that can be fundamental to the protection of the Biosphere. Sacred natural sites are a best example for this. People stop cutting trees and polluting water for example, even though not doing so can be economically beneficial, because they have other relationships with them. We should also show our stewardship by transforming degraded environment to better ecosystems and recuperating lost seeds and knowledge. A large body of research is coming out showing how industrial food production is affecting health and nutrition, harming the environment, eroding cultural values and affecting the rights of food producers. This is deeply worrying personally to me, as country after country in Africa is following this failed food system. All statistical data shows that our health, the environment and the rights of all involved in it will be much more better if we fix our food systems. There is an increasingly louder voice calling for the transformation of food systems. 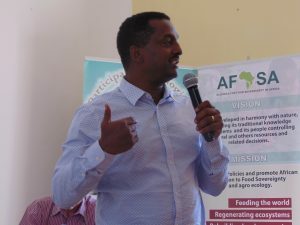 Since we started in 2008, we at AFSA have demonstrated that Food Sovereignty can cool the planet, while feeding the world and regenerating ecosystems. I go to these meetings with the strong voice of AFSA members behind me. After nine meetings this year, I see that a fundamental transformation in the way we are living in Africa and around the world is upon us. Just and equitable ways of life for Africa’s people – self-determined and in harmony with nature – is the transformation towards which we are building.